Al-Fakher Flavored Tobacco is Internationally renowned as the best Flavored Tobacco brand on the market. 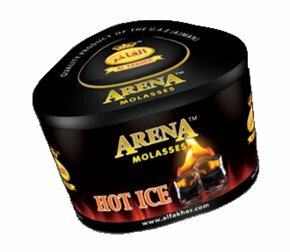 With the introduction of Arena Hookah Tobacco, the world's most recognized flavored tobacco manufacturer is taking Hookah smoking to a new level with this premium line of unique flavors.Area Flavored Tobacco carries the same premium taste, smell, and smoking experience that has made Al-Fakher Tobacco one of the most requested Hookah Tobacco brands in the worldwide marketplace. Arena Hookah Tobacco by Al-Fakher is the right choice for those looking for a reasonably priced brand that offers a strong and flavorful smoke. The Arena Tobacco brand's 250 gram can allows for Hookah users to smoke several times a month or with larger groups.